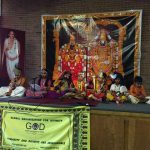 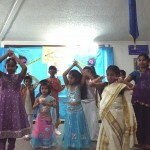 With lord’s immense grace, the “Vibrant India” Gopa Kuteeram camp conducted at Namadwaar in June was a great success. 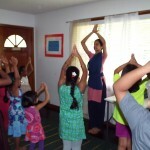 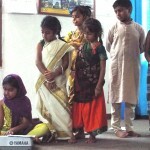 “Vibrant India” was a 3-day camp themed around India’s diversity in all areas. 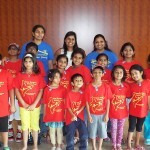 19 kids in the age group 4 to 10 participated in the camp. 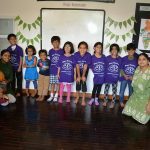 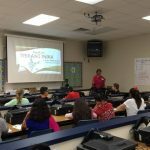 The camp started out with an introductory presentation focusing on India’s variety and ‘natural’ diversity in various areas – language, food, music & dance, art & architecture, clothing, geography/climate, religion and color. 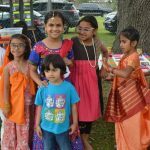 The children then participated in many activities based on this theme – music, dance, Madhubani artwork, yoga, field trip to Asia Society Museum where they had an exhibit on Indian deities including paintings of Raja Ravi Varma, writing workshop, cooking, cricket & kho-kho. 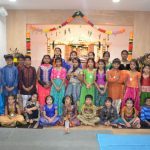 They learned two songs on India – Vande Mataram and Mile Sur Mera Tumhara (this one primarily for the different languages that it showcases, so the kids got to sing a line in 14 different languages). 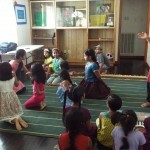 They also dressed in varied regional costumes and danced for these songs at the end of the camp. 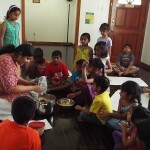 The camp and the info that the children learnt was much appreciated by all parents.